Our meeting room is a comfortable place for retreats, board meetings, special occasions, receptions, and events. We are conveniently located near the University off Geist Road. 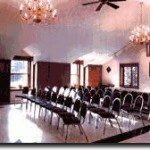 Day rental is only $150.00; deposit required. We welcome you to come by for a tour of our facilities. For more information, reservations, please call 479-0751 or e-mail us at gables7@alaska.net. The meeting room is 30″ x 23″ (690 square feet). The commercial kitchen is 10″ x 20″ (200 square feet) and adjoins the meeting room for a total of 890 square feet.